Creating advance health care directives will allow you to plan for future health care decisions. This is important because if you are incapable of communicating with physicians, you might receive treatment that you don’t want. Making decisions about life-supporting treatment in advance can also save your loved ones from undue emotional pain. 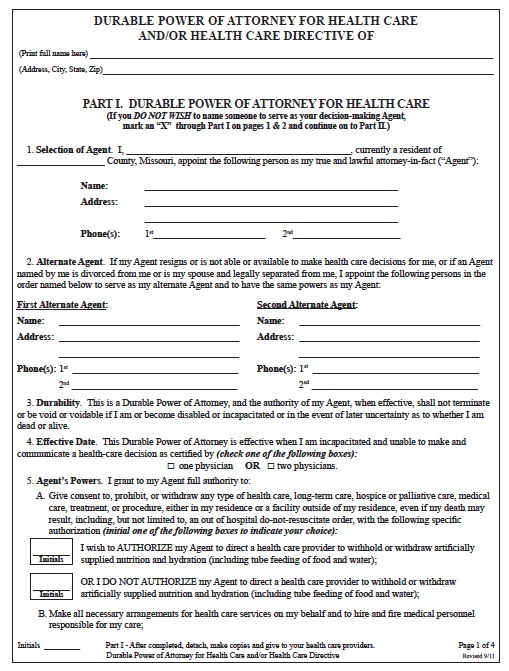 With a durable power of attorney for health care, you can authorize an agent to consent to or withdraw any treatment, long-term care, medical care, surgery, hospice, or palliative care. The standard form in Missouri has separate sections that allow you to authorize the agent to withdraw life-sustaining artificial hydration or nutrition, or you can prohibit the agent from doing so. You can use the advance health care directive form, which is usually attached to the power of attorney for health care, to specify that you do not want life-supporting treatments if you are permanently unconscious with little chance of recovery. These treatments include surgery, artificial hydration and nourishment, antibiotics, dialysis, CPR, mechanical breathing, and chemotherapy, and you can specify that you wish to avoid all other life-sustaining treatments the form does not mention.